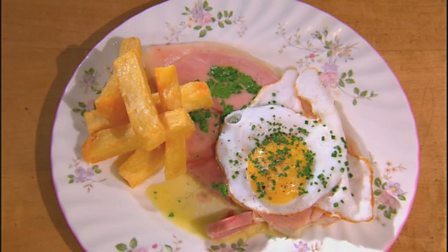 This isn’t your average ham, egg and chips: Tom Kerridge takes it up a notch with homemade chips and fried duck eggs. Fill a frying pan with 1cm/½in water and bring to the boil. Add the butter and once it has melted, add the sliced ham and cook for 1-2 minutes. In a frying pan add a little vegetable oil and fry the duck eggs until cooked to your liking. Place on the serving plates, season with salt and freshly ground black pepper and serve the chips alongside. After the first frying the chips can be kept in the fridge for up to a couple of days until you’re ready to finish cooking them.